As a homeowner, you’re likely familiar with the amount of attention your floors demand. From polishing to refinishing, you may be spending hours a week getting your floors up to speed with the rest of your home. However, you don’t have to live with floors that eat up your free time. Instead of spending your weekends maintaining your floors, replace them with low-maintenance laminate flooring. 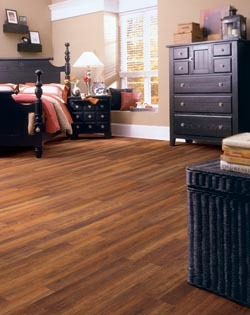 Be sure to schedule professional laminate flooring installation once you’ve chosen the perfect product for your home. Our contractors will visit your home with all the tools and equipment they need to install your laminate product and ensure it performs as intended. Many modern flooring materials demand daily attention and maintenance from their owners. Not laminate, however. Laminate tile flooring is sturdy, long-lasting, and dynamic, making it an excellent option for families searching for a low-maintenance product. Instead of giving up your free time to look after needy flooring products, choose laminate and make the most of your days off. Additionally, laminate flooring comes in many different colors, textures, and patterns. Do you love the look of solid wood floors, but not the price tag or maintenance that comes with them? Opt for a laminate floor that mimics the appearance of true wood. You’ll never have to refinish your lookalike floors. Laminate floors can keep up with even the busiest households. Are you concerned about pets and children ruining your flooring’s appearance? Bring home laminate flooring and never worry again. Accidents, roughhousing, and constant foot traffic won’t diminish laminate’s appearance. Its hard surface resists chips, scratches, and staining. After purchasing your new floors, be sure you take advantage of our professional installation services. You naturally want to get the most use out of your new floors; however, in order to do that, you’ll need help from an experienced and skilled team of installers. Only licensed and certified contractors have the skills and equipment needed to ensure your laminate flooring installation is done correctly. Make the right choice for your home and your new floors by recruiting ours. As contractors with years of installation experience, we’re capable of handling any project you request our help with. We treat your home with the respect it deserves during every phase of installation, and we take time to ensure you’re happy with our work. Enjoy the peace of mind that comes with knowing you’ve entrusted your home to professionals that care about your safety and satisfaction. We are so confident in our work that we guarantee to fix any installation-related issue for the lifespan of your floors. This means that if you spot installation-related issues later on, we’ll always return to make things right at our own expense. Additionally, if you don’t absolutely love your new Four-Star or Five-Star laminate floor after 30 days, we’re more than happy to replace it – no questions asked. Contact our team or visit our showroom to purchase new laminate flooring. We proudly serve customers in Gurnee, Illinois, and the surrounding Lake County, McHenry County, and Northern Cook County areas.